50 years in music. The animal parc celebrated his anniversary, last saturday, in front of the stage of the « Happy Thoiry festival ». LP/E.G.More used to the Zénith, Amir assured 1:30 of sound and light at the end of concert. “The green carpet”, vast area of grass situated below the castle, did not empty till midnight. Thierry Duguet, director of the group Thoiry, at the initiative of the event, wants to make of this demonstration “the biggest family festival of music of the department”. ” With comments heard in the end of the concert, that is going to be difficult not to begin again next year, he congratulates itself. The artists and the public adored the frameand the atmosphere. It is a total success “. More than half spectators had taken a ticket which coupled the visit of the zoo in the day and the concert. ” It consolidates us in the choice of our niche: we need pop rock and of the French songs here: a directory for families, insists Thierry Duguet. Couples with stroller in front of this outdoor scene, This is the vocation of the Happy Thoiry festival. The Small Cap management company explains that it has aroused a craze of LPs as it chose to slightly raise the hard cap of the fund..
Ekkio Capital offers itself the luxury of completing the lifting of its fourth generation fund beyond its objective. The investment company had set the hard cap for this vehicle at € 150 M. But in the face of the influx of subscriptions, she resolved to raise this ceiling to finalize the fundraising at 161 million euros. Eco-friendly and fun, this little vehicle comes to his entry at ParisCityVision, leader of the guided tour in the capital. In the program, four trips of an hour starting at the Rivoli Street, under the arcades, facing the Tuileries. 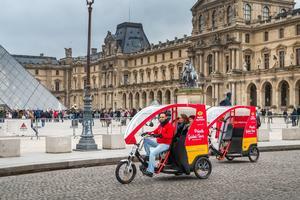 «As soon as our pedicab are out on the street, they are called out’,’ says Corine Cam, the Director of Business Development of ParisCityVision. Dressed in red and yellow, the colors of the company,….. Shoulder Surgery: FX Solutions turns to Ekkio Capital for its American expansion.